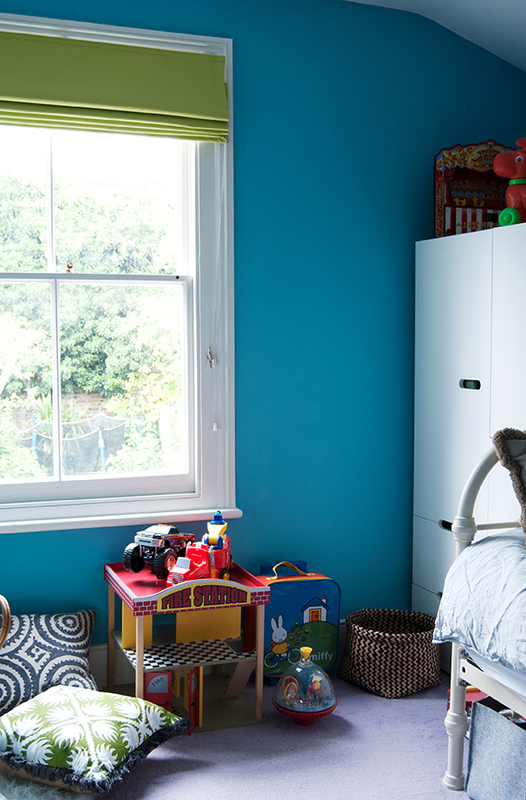 I had a lovely afternoon on Saturday photographing Baxters bedroom for this post. I don't really spend much time in there as my husband does most bed times, but it's such a lovely room with a view of the garden and it's filled with lots of things that belonged to Edie when she was little that have been handed down, given to her by friends and family so it is really rather special. I've bought very little for this room makeover as most things we've owned for years - the walls really do most of the talking which is testament if you needed it, to the transformative powers of paint! This room was my studio when we first moved into this house over seven years ago. I out-grew it pretty quickly, then the room swapping began, and we moved Edie in. Then it became the guest room, and now it’s Baxters bedroom. We like to switch rooms a LOT around here. When I say ‘we’ I mean ‘me’, and my husband definitely doesn’t ‘like’ it. He does tolerate and facilitate it however, so I’m not complaining. This is what the room looked like about five years ago when it was Edie's bedroom (she was five). 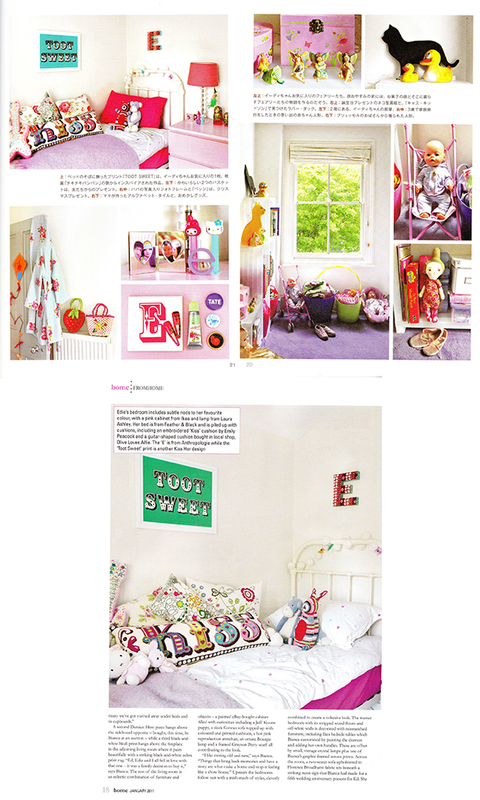 Our house has been in several magazines over years, these top images were taken from a book called London Family Style by the Japanese publishers Paumes, and the bottom image was shot by the lovely Ben Anders for Home Magazine. The article was published in 2011, but I think the shots were taken earlier than that - perhaps in 2010. 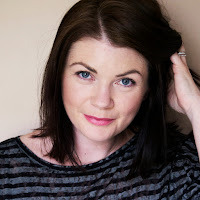 Looking back through these images is like falling into a time warp and I can't believe how much nearly every room in the house has changed, and indeed my taste! See?! There's a hoover, a filthy sponge, cleaning products, a paint tray and roller, and a ladder in the window reflection. That's proof that I was about to start redecorating and that we don't actually live like this! Not all the time anyway. I was determined to get him into this room and into his 'big boys bed' before my mum arrived from New Zealand on the 19th of December, which I did do, but the finishing touches have only just been done, because you know, life got in the way. So without further ado, here it is now, finally ready for it's close up! I wanted Baxter to love his bedroom and feel involved with the big move, so I asked him if he wanted to choose the colour and he very definitely wanted blue. 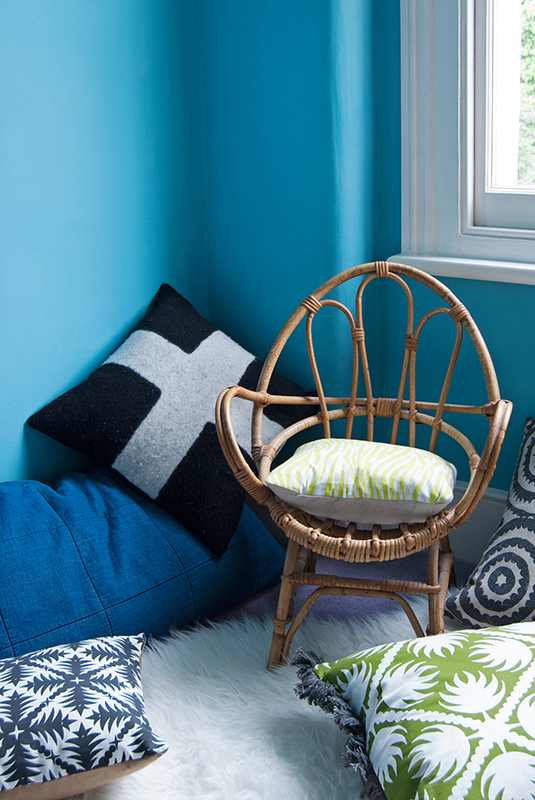 I was pretty pleased with his decision and might have steered him toward the final choice, which is this beautiful St Giles Blue by Farrow and Ball. It slightly scared me when I first started rolling it on, because it’s not exactly a subtle choice, but it didn’t take long for me to totally fall for it - it’s such a deep rich colour, and doesn’t feel cold at all. I had intended to change the green roman blind to a simple dark grey roller blind from Ikea, but I’m still undecided and actually quite like the combination, so I’ve left it as is for now. His wardrobe was from Habitat a few years ago, it’s been taken apart and moved several times (sorry Ed!! ), and is still nice and solid - I love that it’s not too tall so it doesn’t dominate the room as the ceiling in this room is low. The top also acts as a shelf for more toys and jigsaw puzzles. The Stuva range from Ikea is quite similar. The window was in bad shape, so I couldn’t get away without re-painting all the woodwork too - but it’s made a huge difference and I’m so pleased I didn’t decide to ignore it. The door took so many coats I lost track - going back to white from a mid-grey is never going to be quick. 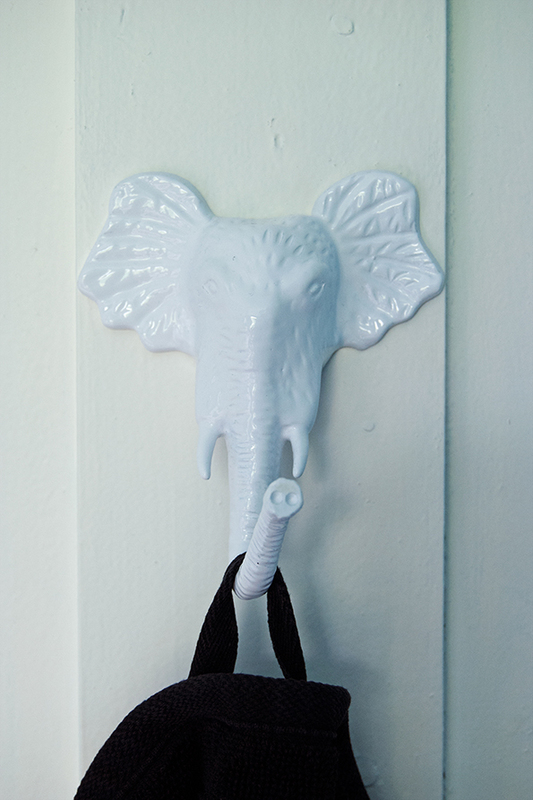 But I do love this cute elephant robe hook from Anthropologie, and some might not, but I like the mix of cold and warm whites. We’ve installed a new light that I picked up from Heals in their sale (reduced from £100 to £30! ), which I wasn’t 100% sure would work in this room, but I love it. It has a long flex and we've hooked it up so it hangs over his reading area. A friend pointed out that it looks a bit like a torch. A very shiny torch - who says a boys room can’t have a bit of bling? Up until yesterday, there was a rather large cardboard space ship taking up pretty much a quarter of his room. It was a Christmas gift and possibly the best £25 I’ve Santa has ever spent. I actually thought it would have fallen apart by now, but it’s surprisingly good, heavy-duty quality, so for now it’s been dismantled and stored behind his wardrobe. It’s only a five minute job to re-build it when he wants to play with it again and freeing up that space has made his room feel huge. I think he will enjoy playing in there even more now with the extra space, and I will certainly spend more time in there reading with him. 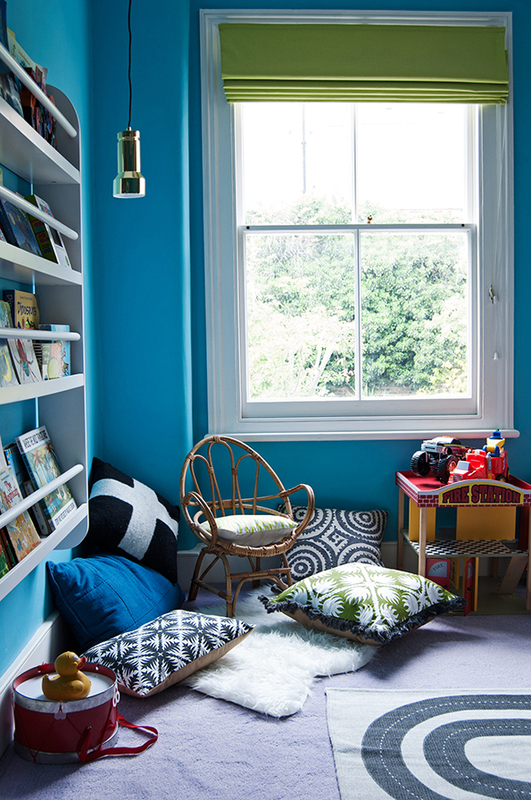 He loves lying on the floor playing lego and cars and reading books, so the new reading corner has lots of cushions alongside his über cute vintage wicker chair which was an eBay purchase a while back. 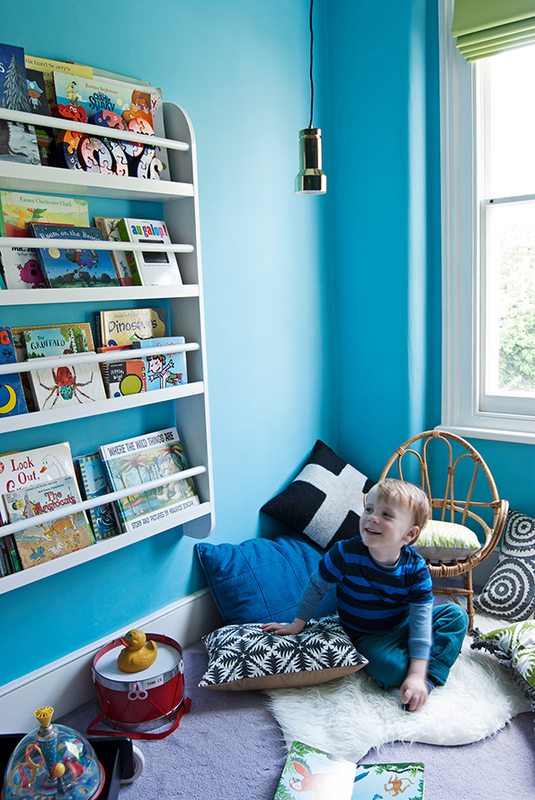 Little Boy Blue himself popped in to see what I was doing to his room, and as you can see he was pretty happy - 'it's the best reading corner EVER, and I want it to stay like this for ever and ever!’. The denim cushions are from H&M. I made the cross cushion from a piece of felted wool (an old passing hobby), the Bahia and Panama cushions are from my Tropica collection, and the black and cream circles cushion is made from Designers Guild fabric. I made the tiny chair cushion from some linen and green zebra print cotton that I got from eBay. His bedside table is the Rast chest of drawers from Ikea, painted with blackboard paint, with knobs from Anthropologie (again, not a recent purchase). The cat light was Edie’s when she was a baby, but you can still buy them here. 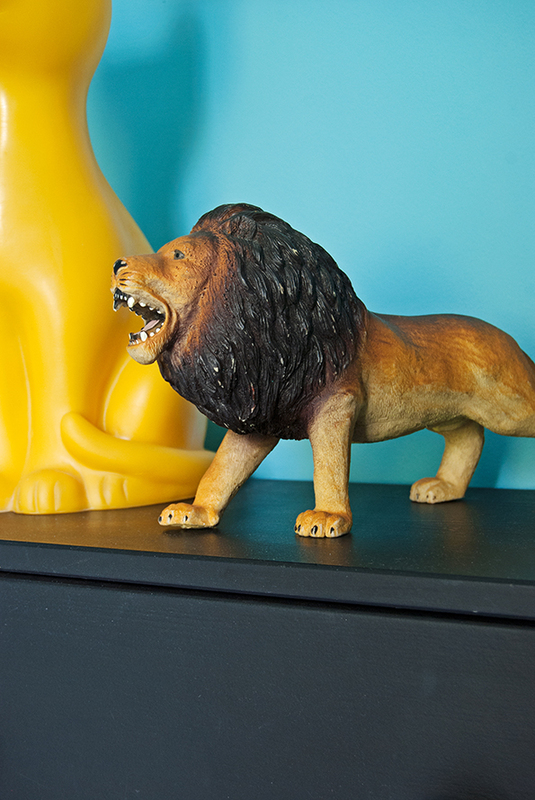 I picked up the rubber lion at a school car boot sale, and the money pot was a gift from my husbands Aunt. The alphabet artwork above his bedside table is by Ben Eine. We bought it probably nine years ago, but you can pick up something similar from Nelly Duff, or obviously find a more affordable option. The safety pin artwork is by me. The 'Oliver' bed was also Edie’s, purchased over seven years ago. I thought about spraying it a dark charcoal grey, but I’m not sure about doing such a big spray job myself and I don't want to ruin it, so I’m leaving it for now. You can still get this bed from Feather and Black. I fear she may soon get bored of her current high sleeper and want this one back, but we'll cross that bridge when we come to it. 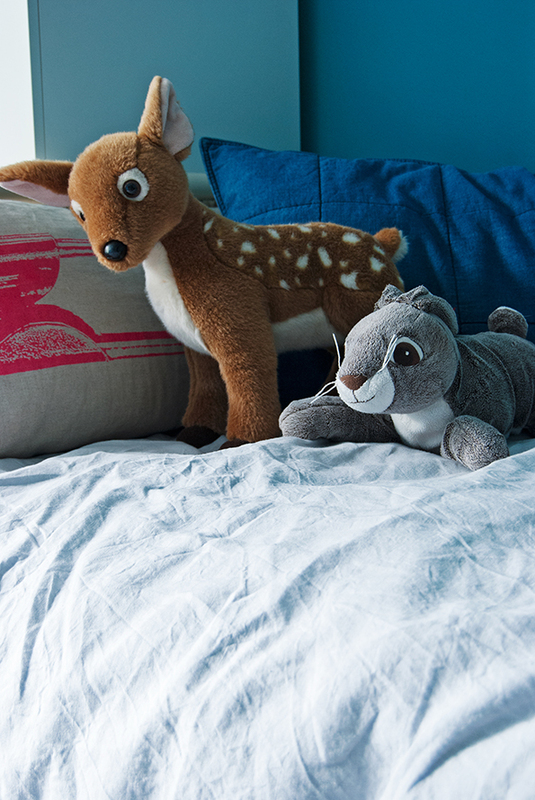 His bedding is also from H&M - they do really affordable 100% linen bedding and I have it in both the kids rooms and the guest room. He sleeps with an absurd number of soft toys in his bed - we’re not allowed to take any of them away, they just get added to. It really is a wonder he sleeps so well. The bookshelf is from The Great Little Trading Company. 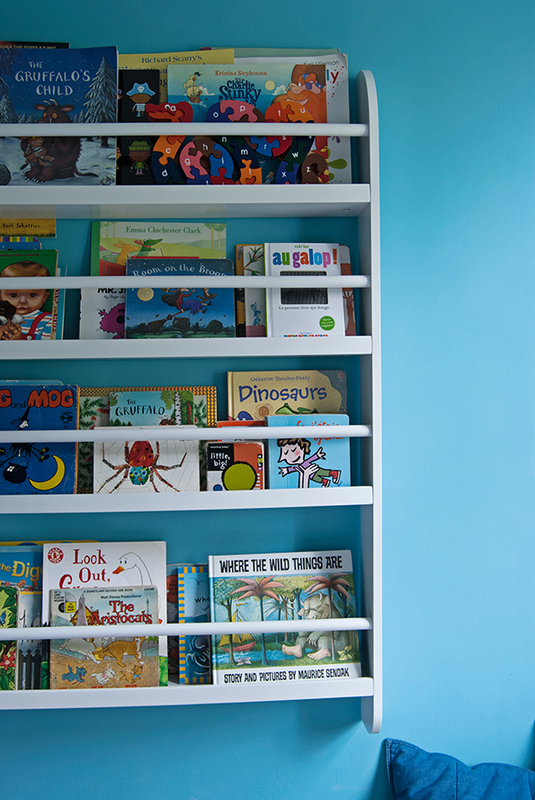 These front facing bookshelves are great value and quality. 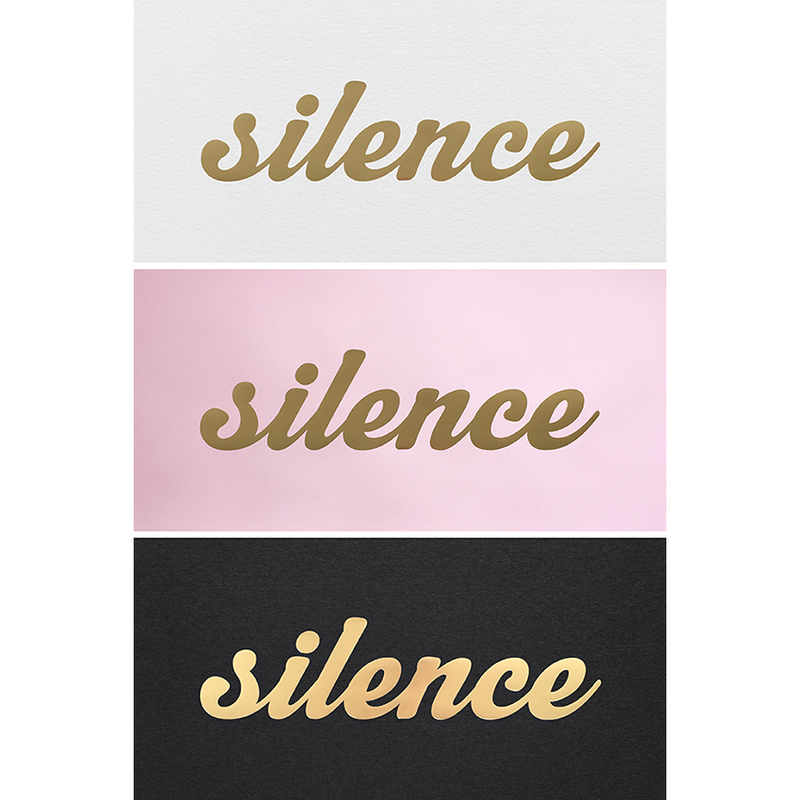 I’d actually like to put one in the living room for displaying pretty books and paint it the same colour as the walls. In fact it’s tempting to have one in every room. Yes, I like it LOTS. I should admit that he has more books in his wardrobe and that this one doesn't hold them all, but I try to keep the numbers in check because kids books are one of those things that can get out of hand - blink and suddenly you have hundreds of them, so I try to go through them regularly and get rid of any that he’s grown out of. Not pictured are the three felt toy baskets under his bed, yet another H&M purchase that has been so great. It’s easy to let kids toys take over the entire house, but this is one thing I’m quite vigilant about. If they have too many toys and they’re too chaotic, broken or with parts missing etc, they just don’t play with anything properly, or at all, so I try to go through his toys and sort them out every two weeks or so. I throw out anything that’s broken, and donate anything he doesn’t play with anymore. Of course some things are too precious to give away, like the big spinning top that actually belongs to Edie that was a gift from Ed’s parents, which we’ll always keep, but a broken plastic helicopter? BIN IT! One day we’ll be replacing the lilac carpet with a charcoal one, but it’s pretty low on the list of priorities right now. 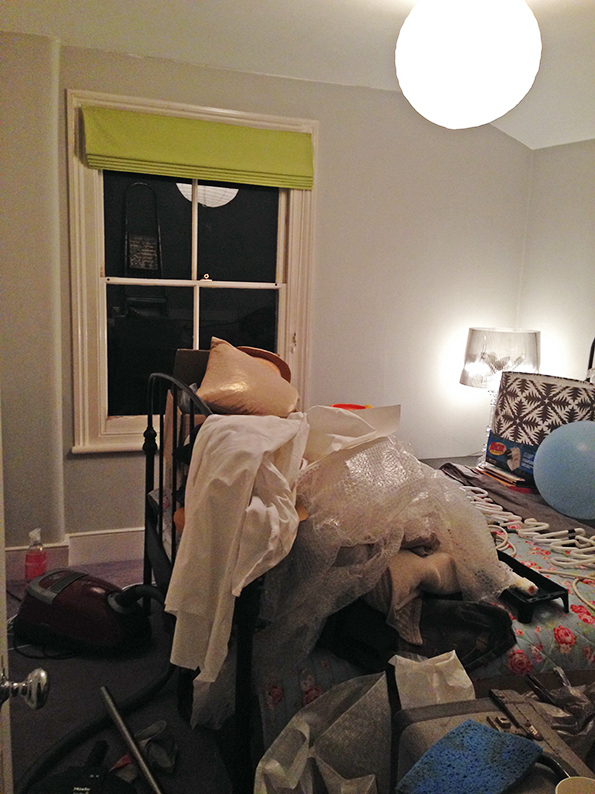 So that’s it for Baxters 'new' room! What do you think? He always wants to show visitors so I think that means he really likes it. I certainly do, and it will be so easy to update it as he grow up. When Edie saw his finished room yesterday she thought it looked 'awesome', and I could almost see the cogs turning in her brain - I know she's hankering for her room to get a little makeover, so she might have to be next on the list.